The in-between spaces that remain within urban areas often pose many challenges for designers. Such spaces get left to form dangerous alleyways or corners that repel people. Also, such spaces do nothing to support their adjacent buildings — from a sensory design perspective. Urban space that is “left behind” often becomes unused, simply existing as wasted space — in other words, a missed opportunity. That’s why it is wonderful to see projects like the one built at London’s Great Ormond Street Hospital. This aural installation takes advantage of what positives the space exudes, and uses those to its advantage to yield more than the sum of its parts. You see, in the in-between urban space (between two buildings) the installation called the Lullaby Factory serves to create music. By integrating instrument-looking horns and pipes, the installation exudes sound (and even song). And the best part is that the installation uplifted an otherwise doomed urban space into a special, uplifting, and engaging space. Urban space sensory installations that coordinate with their adjacent architectural environments can really help an area — by giving more engagement, safety, and enjoyment to its visitors. Such sensory installations can also be interactive: where visitors can work either alone or in a group to create amazing sounds, visualizations, or structural configurations. Such installations create design nodes within urban spaces, and such nodes can serve many functions. You may ask: How does an installation help the architecture which it resides next to? Sensory installations can serve to bring in more building visitors. They can also serve to “prepare” visitors for entrance into a neighboring building. 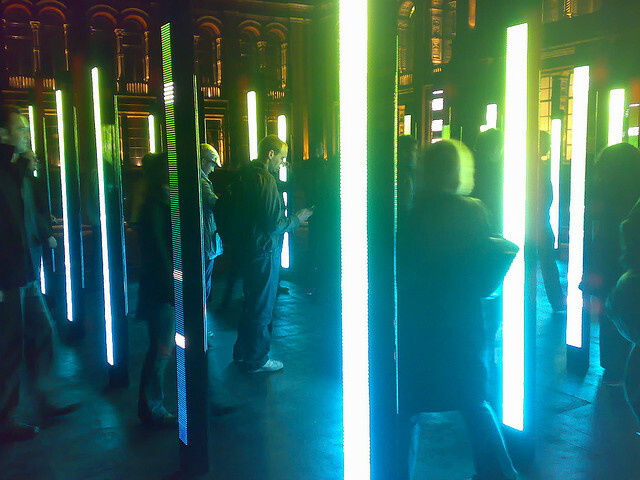 Or they can serve to socially gather people together — as they may work together within an interactive installation. They are a great way to draw attention to an urban area — to make it vibrant again. Don’t let unused forgotten space detract from your project. Instead, find ways to enhance your project because of it. And keep sensory installations in mind, for they are a great way to add uniqueness, vibrancy, and beauty to your design. After all, unused urban space, when designed for properly, can become quite the magnet that engages occupants by peeking their curiosity. Through their senses, such installations can be playful, beautiful, and even educational — so, keep them in mind as you strive to revitalize an urban area, or bring design ingenuity to a new one. Don’t ignore those in-between spaces, for they can make or break your design over time.